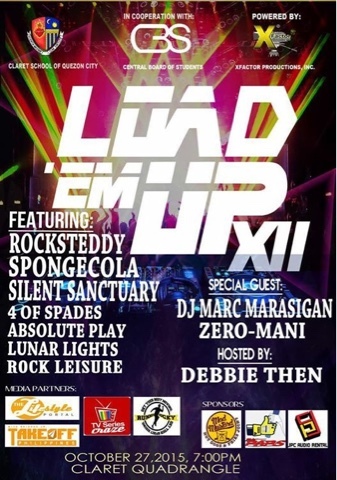 TV Series Craze is the official media partner of the upcoming concert dubbed as "Load Ém Up XII." The concert will bring together the country's top rock band namely Rocksteddy, Spongecola, Silent Sanctuary, 4 of Spades, Absolute Play, Lunar Lights, and Rock Leisure. Aside from these bands, DJ Marc Marasigan and Zero-Mani will also grace the show as special guests. This is the second time around that TV Series Craze brings a concert as an official media partner. The first one was the Johann Mendoza concert in Music Museum last August. The concert is produced by Claret CBS in partnership with X Factor Productions Inc.
Join us this coming Tuesday, October 27, 2015, 7:00pm at the Claret Quadrangle, Quezon City. Claudine Barretto Returns to TV Drama via "MMK"